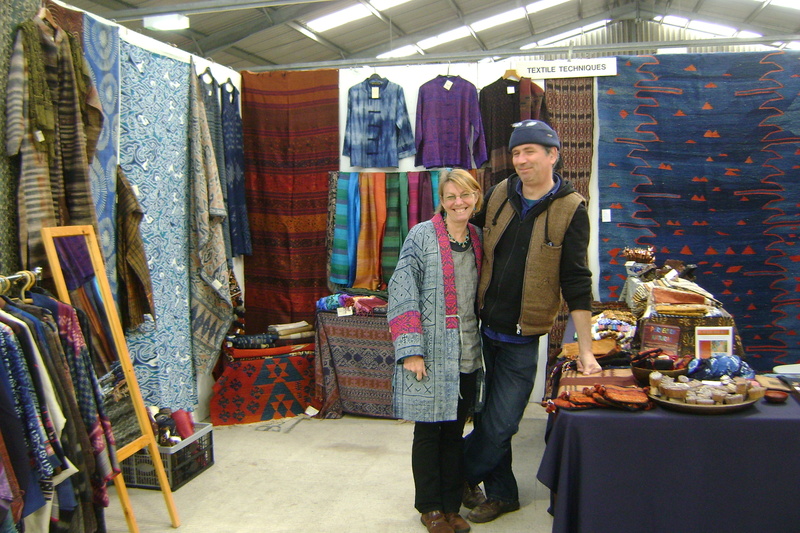 We are Jim and Diane Gaffney and run a business called Textile Traders. We love textiles and we have a shop in Bishop’s Castle, South Shropshire which specialises in hand made textiles from many parts of the world, but especially from the countries we know really well – Turkey, Thailand and Indonesia. We buy as much as we can directly from the makers themselves and make it our job to ensure that they get a fair price for their work. I started writing this blog when we set off on a great overland journey from Uzbekistan to Indonesia. At every stop on the way I bought a textile and tried to find out something about it. It was a wonderful way to travel and meet interesting people, so I highly recommend it! And if you’re interested in getting a regular (ish) newsletter from me, you can sign up for it there. Hi Diane and Jim! I remember taking this photo of you two. What a great couple you make! Thanks for sharing your blog with me. I can’t wait to read all about your amazing journey. Good luck! I was really pleased to receive the email explaining why there was a problem with your blog as I had not been following it and now I am entranced. I am going to follow the Silk Road with Footprints, a Kiwi outfit who offer a wonderful programme following the route from Shanghai to Tashkent. Their information is excellent but yours is even better. I love the real life experiences of post offices and toilets. Looking forward to following in your footsteps at least a bit. Forget the fabrics… how’s the beer? Have very much enjoyed your blogging so far. Where are you now? Hope all’s well and you’re still having a fine time. on May 23, 2013 at 1:08 pm | Reply Jenny E.
I am finding this in May 2013 and you have done pretty much my dream trip… wow!! Really interesting, particularly about Kashgar and the Uyghurs. Really enjoyed reading your blog. I travelled to Java in the early 90’s and had a guide who reluctantly showed us some batik workshops. We went to Borobudor and the Sultan’s Palace. It was part of a trip to the Far East – Bali, Lombok, Hong Kong and Bangkok so we only had a few days in each place. I wish I’d left out Java then and travelled on your trip. I would be repeating the touristy things if I went again. Thanks for the comment Barbara and I recommend you come to Java again. I go every year and never get tired of going to the Kraton to watch the dancing and listen to the gamelan, I still love going to see the puppet shows, the Ramayana Ballet and have even been to Borobodur 5 times! there’s always something new to learn. Just chanced upon your blog- and am delighted! It sounds so interesting. I love textiles. Stumbled upon your blog and promptly fell down a rabbit hole. I started with an abiding love of Indian textiles, but a love of handmade textiles opens up worldwide paths, such as the one you’ve taken. Bookmarked, and following you now!